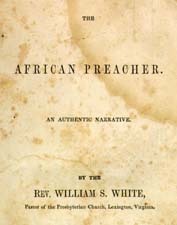 William S. White (William Spotswood), 1800-1873 The African Preacher. An Authentic Narrative. The African Preacher. An Authentic Narrative. Philadelphia: Presbyterian Board of Publication, [c1849]. African American clergy -- Virginia -- Nottoway County -- Biography. African Americans -- Virginia -- Nottoway County -- Biography. African Americans -- Virginia -- Nottoway County -- Religion. Slaveholders -- Virginia -- Nottoway County -- Biography. Slaves -- Religious life -- Virginia -- Nottoway County. Slaves -- Virginia -- Nottoway County -- Biography.